Chris Wilder feels Cobblers and Oxford United are similar clubs in terms of the ambition and passion shown by their supporters. 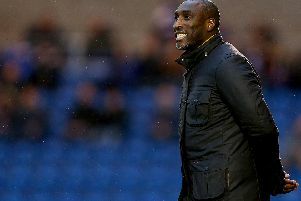 Wilder has managed both, having steered Oxford to promotion to the Football League before eventually leaving to join Northampton in January last year. The teams have been going in opposite directions in recent weeks, with Cobblers failing to win any of their past four league games and Oxford yet to be beaten this season. But Wilder insists there is no gulf between the sides and is predicting an ‘interesting’ Sky Bet League Two encounter at Sixfields on Saturday. “Both sets of supporters are ambitious, both are passionate,” said the Cobblers boss. “Oxford have had recent success in the ‘80s and ‘90s, mixing it with the big boys for a few years. “Northampton have obviously played in the top league as well, but they’re both clubs that want to do well. “I’ve got great memories of the time at Oxford, but it has changed quite dramatically and they’re having a go, which every football manager wants to hear. “That’s not me heaping pressure on (Oxford boss) Michael (Appleton), he understands that, and they have got some really good players that they’ve attracted to the football club. “I’m sure they’ll be in and around it come the end of the season. “Their start has been good, but they’ve had tough games. “That was a tough game on Sunday (at Bristol Rovers), all three resuls could have happened there. “They’ve got Kemar Roofe who is making a difference for them and scoring important goals. Cobblers were well beaten when they last hosted Oxford, losing 3-1 at Sixfields last October thanks to two goals from Danny Hylton and one from now Town winger Alfie Potter. But Wilder’s men had the better of the 1-1 draw between the two teams at the Kassam Stadium in April, with Alex MacDonald’s 90th-minute effort denying the away side the win. “They had a difficult year last year, but they were better than us here and deservedly won,” Wilder said. “I think we were better than them at the end of the season and should have won. “It’s a tough competition, a tough division, but they’ve recruited really well in the summer, with the likes of Ryan Taylor, (George) Baldock and Sam Slocombe coming in. “They’ve added some good players to what was some decent players there already. “There really is a big ambition from the chairman there. “I still keep in contact with people in and around the area and I know a couple of people who have got involved financially to kick them on. “They are local people who have liked the way the club’s going through the actions of the chairman. “A big thing for Michael, who wants them to get the ball down and play, like we did when we first got out of the Conference, they need a good pitch to work on. “They certainly didn’t have that when they had the rugby (London Welsh) there, but with the investment in the pitch it has helped the footballers they have got. “I do believe that the ambition for them has gone from ‘let’s do our best to get there’ to another level, and with that backing and focus from the top they’ve got the drive.